Stranraer, the largest settlement in South West Scotland, laying at the head of Loch Ryan just above the border. This town is situated on the north side of the neck of land that prevents the Rhins of Galloway becoming a separate island. The town’s origins date back nearly 500 years. Stranraer Castle, also known as the Castle of St John, built in 1511 being the largest monument to this history. This now stands in the centre of the town, but it was originally built behind the broad beach at the head of Loch Ryan. Only later did a settlement begin to grow around it. Situated at the head of Loch Ryan, and known for having a long history as a ferry port. Stranraer is the gateway to the Rhinns of Galloway and was a busy ferry port for more than a century running services between South-West Scotland and Northern Ireland. The town has many shops and there are plenty of restaurants and cafes. The town’s main attraction is the Castle of St. John, a ruined four-story tower house built around 1500, which sits on a green in the main street. 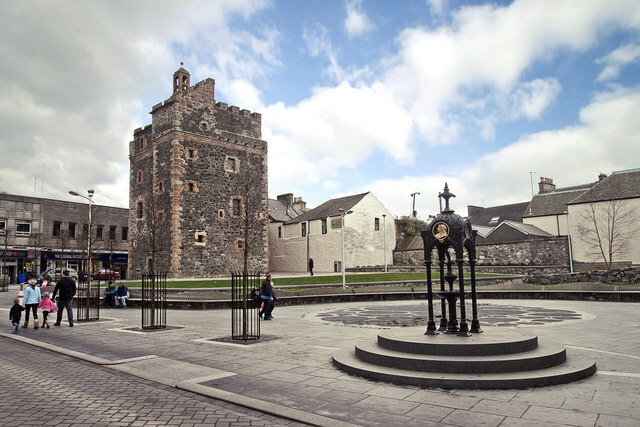 There are several eye-catching artworks in Stranraer surrounding the castle. In the old town hall you may wish to visit the Museum containing lots on local history. Stranraer is a town with more going for it than usually gets mentioned in guide books. The town centre is surprisingly attractive and bustling, while it helps to see it on a sunny day, the whites and bright colours of many of the buildings make it brighter in any light. So, to dip a toe into the seaside of Scotland this might be the perfect town! For a wee day out just above the wall, come to visit this coastal gem.